It's a new Brown Paper Bag Project* beer of unknown style. The plan is to have everyone open the beer at the same time and tweet about what we see, smell and taste. If you are on twitter, you can follow the discussion using the hashtag above. You can also follow the brewery on their twitter account. I'm going to be live blogging for my non twitter readers so either read the finished post later tonight/tomorrow or else come back at 8PM and refresh the blog post. You can also follow my twitter feed on the right hand side without having to be a twitter user. Even with careful pouring, it's a foam bomb. A massive foamy white head, pours the colour of spun gold but once it settles in the glass, seems more a hazy straw. Aroma of grapefruit, orange marmalade, honey. A thick, almost chewy body. Plenty of citrus and quite bitter. I suspect the ABV is more than it seems. I agree with @beinmysolo as Nelson was the first thing I thought of (hops). 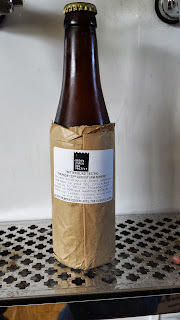 Been told they are US hops: @BrownPaperBagP So not Nelson then.... El Dorado? I'm loving the bitterness, it lingers and interacts with the pepper, yeast and citrus. Second pour is a little more sensible. I'm enjoying this more and more. So lots of Amarillo and dry hopped with cascade. Just waiting to hear what the bittering hop is. Magnum is the bittering hop. From the brewer: Small bit of Magnum for bittering, loads of Amarillo late in the boil, and Cascade dry hop. That's all our hops. The grain bill appears to be mostly wheat, with pale and vienna. I think it would actually go very well with a rocket (arugula) based salad. So, it's only 5.4% ABV which is not what I thought. Beer is called Doxie and is now pouring in both pubs (see below) as well as from select liquor stores. That's all for the live Blogging. 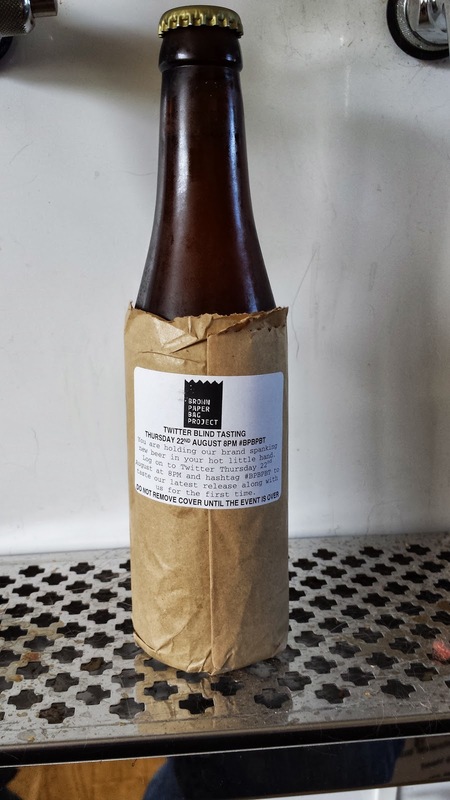 *The Brown Paper Bag Project is a gypsy brewery run by the guys responsible for the wonderful Dublin pub/food emporiums: L. Mulligan Grocer and W.J. Kavanagh's.